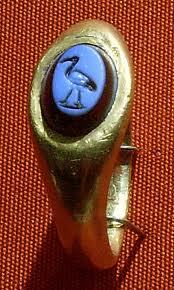 Egyptian Nicolo Intaglio, Second Century AD. The Metropolitan Museum of Art. Nicolo is a cameo or intaglio that is carved in onyx in such a way that the image displays a translucent bluish/grey color. This thin top layer of design lays atop a thicker layer of black material that shows through, imbuing the design with the characteristic tint of blue. Nicolo pieces have been carved since antiquity.